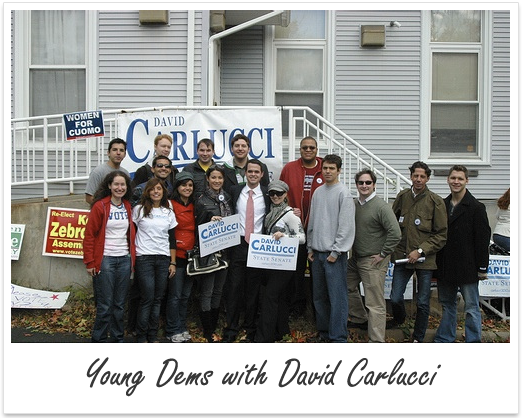 The Manhattan Young Democrats were very excited to join forces with other NYSYD Chapters to help Senator-Elect David Carlucci win his State Senate this November! This month’s NYSYD Newsletter included a thank you from the man himself! Check it out in full HERE. This November, with the partnership, the dedication and hard work of the NYSYD’s we were able to win a seat that many said was impossible to win. I extend my deepest and heartfelt gratitude for all of the blood, sweat and tears that the Young Dem’s put into my New York State Senate campaign. The 38th Senate district, which represents Rockland and parts of Orange counties, has traditionally been held by Republicans, yet young Democrats throughout the region worked with many local organizations to help me win this hotly contested race. Without active young Democrats, this achievement wouldn’t have been possible.